Several years ago, when I was 50 kilogrammes heavier, attempting to bend over, squat or kneel were monumental tasks akin to climbing Mt Everest. So, as the days grew closer to Holy Thursday, I would be filled with trepidation and much anxiety over the prospect of not being able to complete the entire line of feet to be washed. And if through sheer luck, the above task was accomplished, I then had to contend with the additional conundrum of having sufficient stamina of getting through the rest of the Holy Triduum. One (liturgy) down, three more to go! Sigh. I am thankful that the considerable weight loss has certainly made the physically challenging rituals of the Holy Triduum a little more attainable. In truth, I shouldn’t be whining at all. My ritualised ‘passion’ seems like a spa experience in comparison to the Lord’s suffering. Tonight, we accompany Our Lord and Saviour as He approaches the climax of His life’s mission. The pace quickens as our Saviour hastens to the events that are so familiar to us: today, the dinner, but tomorrow the trial, the scourging, the haggard procession with the cross, and the brutal crucifixion itself. The Church speaks of an end, but now as the end of this week draws near, we must also speak of the beginning, and understand both. What is old and coming to an end, and also what is new and coming to life. On this Holy Thursday, our attention is drawn to numerous themes, but the Church pays special attention to two in particular – the institution of the priesthood and the institution of the Mystical Supper, the Eucharist. However, there is one part of our liturgy that stands out both in the gospel text as well as in the ritual to follow, the humbling posture of washing feet. In a way, this little action summarises both the Priesthood as well as the Eucharist. After hearing in the first reading from Exodus, how the children of Israel stood during the Passover meal to eat the slaughtered lamb in front of them, we listen to the account of the washing of the disciples’ feet from the Gospel. Jesus, the Son of God, does something that even the lowliest slaves of that time did not do. He ties a towel around His waist, stoops down in front of each of His disciples, and washes their feet. This single movement could be a summary of the entire mission of Christ. Our Incarnate God debases Himself, becoming an infant sleeping in a feeding trough, a man crucified as a common criminal, and is seemingly ordinary bread to be broken and eaten. In all of these savings deeds, God stoops down to His people. All that the Scriptures say about God’s walking, descending, bending down, being with, helping, bringing to birth, carrying, and so on, are simply different ways of describing God’s gracious condescension. Because man will not bow down to God, God, in His infinite humility, bows down to man. On the night He was betrayed, Christ sets aside His garments, and stooped down to wash the feet of a man who would deny him three times (Jn. 13. 4-6). That’s how God was with the people of Israel. That’s how He is with everyone. On this day, we are given a vision of God’s new creation. By this humble act, as He washes away the filth and grime from the feet that trod upon the dusty paths of Palestine and the alleys of Jerusalem, He will create something new. Ordinary men are transformed. Earthbound men with feet of clay will now soar to the heavenly heights of virtue and will keep company with the angels in the presence of God. 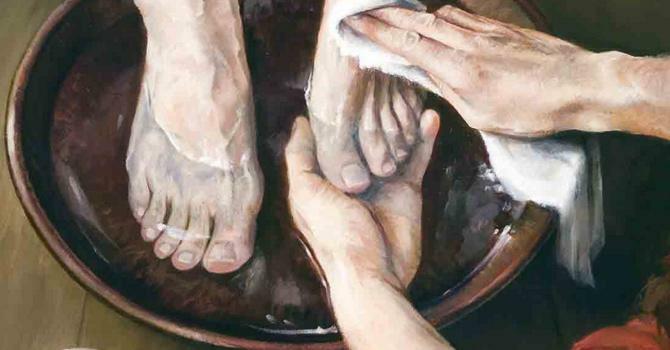 This is why the washing of the feet and Baptism are closely linked, because the results are the same: we put on Christ, who is our Lord and Teacher, and we strive to be all that He is, by doing what He has commanded. For all of us who live in this new creation, “washing one another’s feet” means giving ourselves to one another in all humility, service and love. Make no mistake; even now, “foot washing” is not an easy task in our world with all the benefits of modern hygiene. The extent of our Lord’s love for us can be seen precisely in this, as He takes the filthy, dirty feet of His disciples and washes them clean. The dirt and grime are precisely what makes this act so beautiful. In that soiled water, our Lord has called forth new life, a life purified and clean. He has called forth life that proclaims power in weakness, the triumph of humility and service, the victory of love, and the death of selfishness. Out of these waters, just like the waters of baptism, He has called us to emulate Him. If we have called Him our Lord and King at our baptism, we ought to “wash one another’s feet,” just as our Lord and Teacher has done. Tonight Jesus waits upon His friends. It does seem to be the calm before the storm. Tomorrow He will do the same in another way. He is the servant who comes to wash and to cleanse; today with water, and tomorrow with blood. Both will be one. We are washed through water and blood. We are purified through Baptism and Eucharist. Today, bread is broken and wine is outpoured. Tomorrow a Body will be broken and Blood will flow. The two acts will not be divided in the end. The one shall become the other as God’s love in Jesus Christ expands and enlarges. The today and tomorrow of God with us and for us, God near to us in Jesus Christ, is but one revelation coming from the loving heart of the Father and shown forth in the compassion and kindness of His Son. Tonight is tender and tame. Tomorrow will be callous and cruel. But love would prevail, love would conquer, love would emerge victor!